Vivahsri is developed by SMYR LLP, an IT Firm having vast experience. 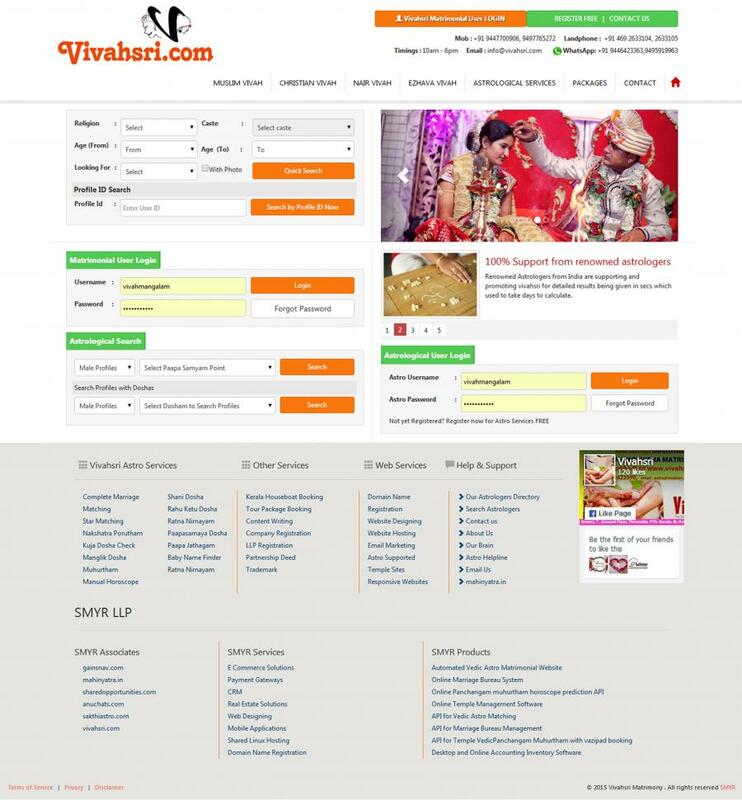 Vivahsri.com is an unique matrimonial site , in fact Vivahsri is first of its kind. We match profiles not only to preferences set by users but also to the horoscope based on traditional Vedic astro calculations. Though other leading matrimonial sites do provide astro services, but non give such detailed results as we do. At Vivahsri anyone can register and get complete Online horoscope check for Papa, Chowwa, Nakshatra, Sudha, Dasa Sandhi, Bhava, Dheerkha Mangalya Yoga compared profiles. 1000's of matching conditions are compared and perfected to reduce the trips to astrologers with non matching profiles. Take only those matching profiles to astrologers, those which you want a final opinion on before contacting the opposite party. Leading astrologers in Maharashtra and Kerala are not only supporting us but also promoting.